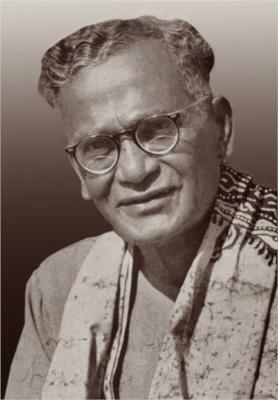 Nandalal Bose (Nondo-lal Boshū) (3 December 1882 – 16 April 1966) was one of the pioneers of modern Indian art and a key figure of Contextual Modernism. 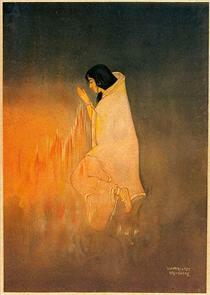 A pupil of Abanindranath Tagore, Bose was known for his "Indian style" of painting. He became the principal of Kala Bhavan, Santiniketan in 1922. 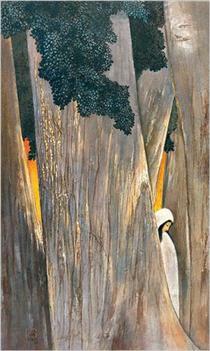 He was influenced by the Tagore family and the murals of Ajanta; his classic works include paintings of scenes from Indian mythologies, women, and village life. 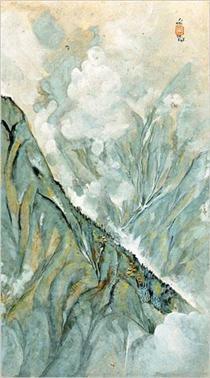 Today, many critics consider his paintings among India's most important modern paintings. In 1976, the Archaeological Survey of India, Department of Culture, Govt. 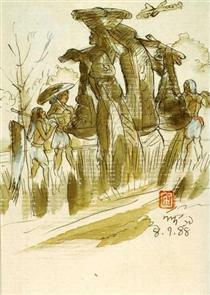 of India declared his works among the "nine artists" whose work, "not being antiquities", were to be henceforth considered "to be art treasures, having regard to their artistic and aesthetic value". 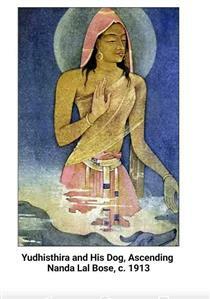 He was given the work of illustrating the constitution of India. Nandalal was born on 3 December 1882 in a middle-class Bengali family of Kharagpur, in, Munger district of Bihar state. His father, Purnachandra Bose, was at that time working in the Darbhanga Estate. His mother Kshetramonidevi was a housewife with a skill in improvising toys and dolls for young Nandalal. From his early days Nandalal began taking an interest in modelling images and later, decorating Puja pandals. In 1898, at the age of fifteen, Nandalal moved to Calcutta for his high school studies in the Central Collegiate School. 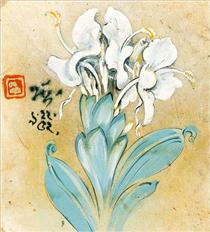 After clearing his examinations in 1902, he continued his college studies at the same institution. In June 1903 he married Sudhiradevi, the daughter of a family friend. Nanadalal wanted to study art, but he was not given permission by his family. Unable to qualify for promotion in his classes, Nandalal moved to other colleges, joining the Presidency College in 1905 to study commerce. 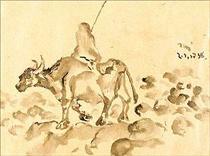 After repeated failures, he persuaded his family to let him study art at Calcutta's School of Art. 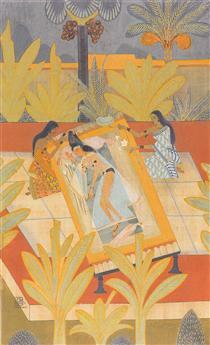 As a young artist, Nandalal Bose was deeply influenced by the murals of the Ajanta Caves. 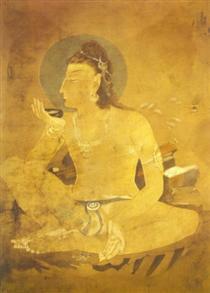 He had become part of an international circle of artists and writers seeking to revive classical Indian culture; a circle that already included Okakura Kakuzō, William Rothenstein, Yokoyama Taikan, Christiana Herringham, Laurence Binyon, Abanindranath Tagore, and the seminal London Modernist sculptors Eric Gill and Jacob Epstein. 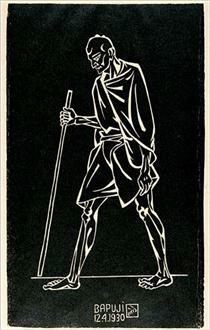 To mark the 1930 occasion of Mahatma Gandhi's arrest for protesting the British tax on salt, Bose created a black on white linocut print of Gandhi walking with a staff. It became the iconic image for the non-violence movement. His genius and original style were recognised by famous artists and art critics like Gaganendranath Tagore, Ananda Coomaraswamy and O. C. Ganguli. These lovers of art felt that objective criticism was necessary for the development of painting and founded the Indian Society of Oriental Art. He became principal of the Kala Bhavana (College of Arts) at Tagore's International University Santiniketan in 1922. He was also famously asked by Jawaharlal Nehru to sketch the emblems for the Government of India's awards, including the Bharat Ratna and the Padma Shri. Along with his students, Nandalal Bose took up the historic task of beautifying/decorating the original manuscript of the Constitution of India. Floating a Canoe Nandalal Bose ? 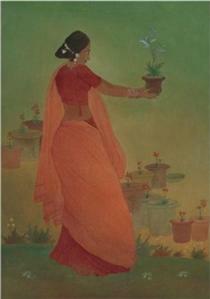 Flower gatherer Nandalal Bose ? Siva drinking World Poison Nandalal Bose ? 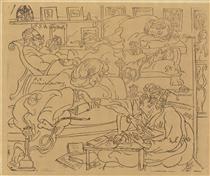 The Studio of Abanindranath Tagore Nandalal Bose ? 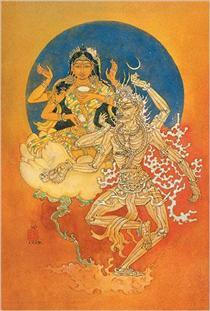 unknown title Nandalal Bose ? Village Huts Nandalal Bose ?